Recently, the Twitter of the New York Times archives shared an 1877 account out of a haunting in Ohio: “QUEER ANTICS IN A STAID QUAKER FAMILY’S PANTRY AND PARLOR,” it declared. 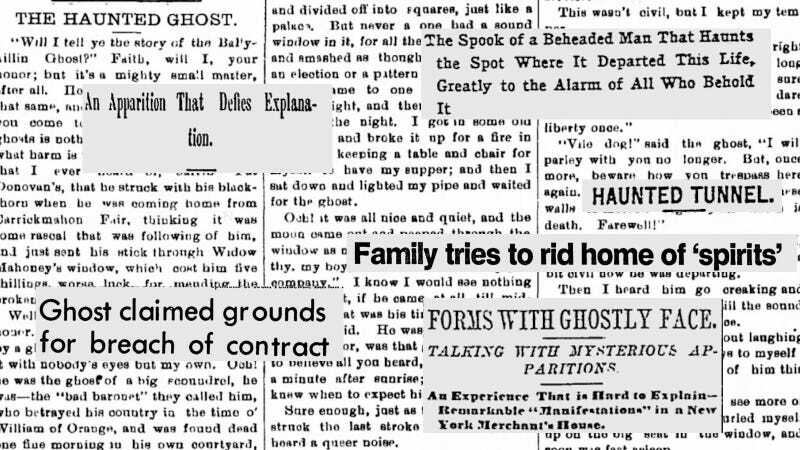 This is far from the only ghost content you’ll find in the archives of America’s newspapers. The tumultuous nineteenth century saw a surge in interest in the concept of ghosts. The spiritualist movement, which would last well into the 1920s, blossomed as seemingly miraculous new technologies shrunk distances and made communication easier than ever. It’s therefore fitting that newspapers were one of the means of propagating these stories, which might originally appear in the middle of the country before being picked up by another outlet several states away. For instance, this 1905 Boston Evening Transcript story, a reprint from the Indiana Sentinel. Word of a ghostly woman in black could travel all the way from Cleveland, Tennessee to Eugene, Oregon. Or make a shorter hop, like New York City to Hartford Connecticut. Jezebel’s annual scary stories contest appears to be part of a long journalistic tradition, too. The spiritualist movement petered out around the time of the Great Depression, but the deep and abiding human fascination with the other side certainly did not. Hence, the ghostly headlines kept coming. Though, admittedly, sometimes they were in the vein of debunkery. The more modern subgenre of the newspaper ghost story would be the real estate nightmare. For instance, this 1979 report, picked up off the AP wire by the Evening News. “Does the ghost of Simon J. Schermerhorn hover in the handsome mansion he built in suburban Rotterdam in 1857 and reach out with skeletal fingers to rearrange furniture? “They say things sometimes go bump in the night—and in the day—at their rented home,” The Ledger reported. “And it has gotten past the point of being amusing. They tell of sudden chills, temporary body possessions, unexplained sulfurous odors, apparitions and a long-forgotten graveyard.” Never, ever tell me that clickbait is new. Ultimately, however, there’s only one news story about ghosts that matters, and it’s this 1928 explainer from the Lewiston Daily Sun. Hey, could somebody run down to the Octagon House and check for ghost cats? No reason.